The HTC One continues its emphasis on camera with a lot to talk about in the video department. Obviously OIS helps video recording look more stable when hand-held, beyond that there are stereo dual-membrane MEMS microphones, higher bitrate H.264, and low light comparisons to be made with the HTC One. 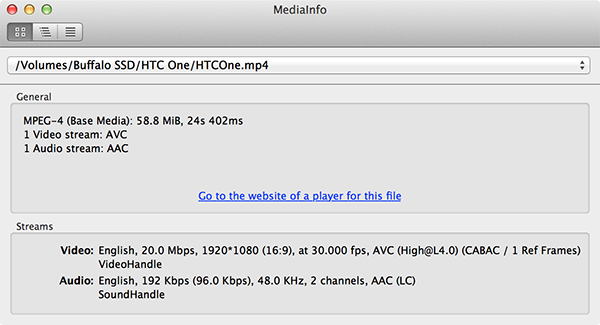 There are a bunch of video modes on the HTC One which they’ve outlined nicely under Video Resolutions on the camera spec page. The HTC One doesn’t support 1080p60, something I know a lot of users want, it seems like we’re still a generation away from being able to deliver that. HTC includes a mode switch under the Video Capture Mode menu, and the mapping is Normal (1080p30), Slow motion video (768x432p96), Fast HD (720p60), Video HDR (1080p28). I’ve been writing forever about how OEMs choose oddly enough to not go for the maximum capabilities of the encoders on the SoCs they’ve included. The One goes for the full APQ8064 encode block capabilities of 20 Mbps H.264 high profile this time around. It’s still 1 reference frame, but kudos to HTC for maxing out the encoder capabilities of APQ8064/APQ8064T this generation so I can stop talking about it. Audio is stereo 48 kHz 96.0 kbps AAC per track. I made a number of videos with two 1080p frames side by side for comparison. First is the HTC One normal versus HDR comparison, which allows you to see a difference in the sky between the non HDR and HDR version. In the normal 1080p video it’s totally saturated, in the HDR video we can see clouds and sky, and the street appears different as well. There are however some recombination artifacts visible during fast panning left and right. There’s also some odd hysteresis at the beginning as you begin shooting video where the brightness of the whole scene changes and adapts for a second. This ostensibly prevents the whole scene from quickly changing exposures, but at the beginning it’s a little weird to see that fade-in effect which comes with all HDR video. HTC enables video HDR by running its video capture at twice the framerate with an interlaced high and low exposure that then get computationally recombined into a single frame which gets sent off to the encoder. There’s some of this outlined in the camera whitepaper as well. Next up is how much impact OIS makes on video recording. HTC joins Nokia in including a hardware image stabilization solution which physically moves the lens module around inside the smartphone to dampen out movement. Other OEMs currently are implementing EIS solutions (Electronic Image Stabilization) which works by leveraging a region of pixels around the center 1080 or whatever resolution crop and either an algorithm watching features in the image or the same gyro used by the AP. In the case of the One, OIS is provided partly thanks to an invensense gyro which can sample at up to 2kHz and in conjunction with with the camera module can correct up to +/- 1 degree in yaw and pitch angle. For still images, this means you can run an exposure longer before running up against blurriness from hand movement, for videos this means much more stable shots with all the high frequency shake hopefully removed. OIS is immediately evident when holding the One and running the camera preview, quick shakes and fast pans are damped out, and if you stare at the module on the back side and slightly move the device you can see the whole lens assembly counteract your motion as well. So how does it work in practice? I decided to compare with the Lumia 920 in my camera bracket, which makes it easy to guarantee the same shakes and impulses are conveyed to both cameras. I stomped around while shooting video simultaneously on both cameras, then edited together the result side by side and synced them up. First of all, it goes without saying that the One blows away the devices which only can use EIS when it comes to video stabilization, which means essentially everything besides the Lumia 920. The One does an impressive job damping out the high frequency movement, but doesn’t quite match the Lumia 920, which looks so good that you’d think it’s on a tripod or steadicam or something. Only the most aggressive of shakes show up in the Lumia 920’s output video, while I feel like the One could be a bit more generous with the low frequency shakes. Still, having OIS on an Android device is a huge boon. The normal video bench location is essentially closed down with not a lot to look at while construction re-starts there on the modern streetcar project, so I’ve recorded a few other samples at other locations. I’ve also uploaded samples of the videos in their original form if you’re interested in seeing them without YouTube’s transcode or resizing. There’s a 1080p HDR sample, 1080p normal sample, 720p60 sample, and the fast/slow motion mode 768x432 video which gets played back at 30fps. The quality of normal 1080p30 video on the HTC One is good, and it doesn’t appear to drop any frames during capture in daylight or outdoors. Also since the bitrate is nice and high, I don’t see any encode artifacts to complain about. I can’t however shake the feeling that it should be a bit sharper. It’s likely that HTC is sampling the sensor at 1080p natively rather than able to request the full sensor output then downsample and encode, which would make the quality of output video even sharper. It’s good it just isn’t mind-blowing outdoors in broad daylight. Switching into video mode also doesn’t result in magnification changing wildly, though it’s obvious there is a bit of a crop going on, but it’s slight, and I suspect to leave some pixels for additional image stabilization reasons. At night however the One really shines. I put together another comparison video with the One, iPhone 5, and Lumia 920 in side by side to demonstrate the differences in low light behavior. Here the benefits in having those bigger pixels pay off. The One is substantially brighter than either of the other two phones. The Lumia 920 prioritizes framerate and keeps things exactly at 30, which results in the video looking much darker. The iPhone has distracting EIS which runs and results in lights and other point sources looking like they’re blurring in all directions while I walk along the path. HTC lets the framerate slip into the 20s on the One, but looks a heck of a lot brighter. In the final parking garage scene there are a few parts where we can’t see anything on the Lumia but can see the scene on the One. Last but not least are the special high dynamic range microphones on the HTC One, which are dual-membrane MEMS. Both microphones on the One are these special MEMS dual membrane type. The idea is to have one region with a large membrane that works when ambient noise is quieter (lower SPL, higher sensitivity), and a second smaller membrane for higher volume (higher SPL, lower sensitivity) ambient noise. There’s a crossover point in loudness where one microphone gets used, somewhere around 70 dBA. The goal is to both be sensitive in quiet scenarios and still not saturate in loud scenarios like a concert or some other much louder situation. HTC also claims that the microphones simply are better than the competition and able to record more dynamic range in frequency space. Inclusion of higher end MEMS microphones isn’t something that only HTC has done, Nokia also did this on their PureView devices though I’m not as clear about the details there. I’m very impressed with the audio recording quality of the HTC One. I took the One out and recorded video in a setting so loud (~155 dBA) that it would cause hearing damage without protection and absolutely positively saturates just about every smartphone camera I can throw at it, and even higher end microphones on dedicated video cameras. You just don’t hear anything other than clipping on most devices. The One doesn’t saturate at all in this setting, amazingly. I’ll leave it to you to figure out what setting this was based on the spectogram. I ran a frequency sweep in front of some very loud speakers from 20 Hz to 20 kHz and recorded the output on the iPhone 5 and HTC One to see if HTC’s claims about frequency response also are valid. Turns out, they are, and I didn’t realize it but Apple cuts microphone output at around 16 kHz and can’t resolve above it, in addition we can see lots of power which is entirely just noise. The HTC One meanwhile goes up to around 22 kHz, also encodes more lower frequency components as well during the beginning of the sweep, and has less noise. There’s a definite audible difference in the recording made by the iPhone 5 and HTC One if you can resolve these frequencies on your speakers. The combination of OIS, unique CMOS sensor, and special microphones makes the video recording experience on the HTC One demonstrably better than pretty much all other smartphones. I’m impressed that we have not one but two handset makers now including OIS, even though I feel that there’s room for additional tuning of OIS even on the final hardware and software to damp out more low frequency events and make the video even more buttery smooth. HTC’s dual membrane MEMS microphones also don’t saturate in even the most challenging environments, HTC is using the fullest output of the encoder, and video quality for the most part is good enough that I don’t have a problem using it when recording demos at shows or of things that are important to me. Low light performance is also head and shoulders above the competition.